My son has been actively involved in fencing since he was 7, and he is a junior coach for Historical European Martial Arts (HEMA) camps during the summer. While his current arsenal of weapons consists of epees, we are in the process of ordering him a long sword to use in his historic weapons program. Therefore, it was with great interest that I learned that a new Texas law will permit the open carry of swords and other long-blade weapons. The phrase “everything’s bigger in Texas” is about to become even more clear-cut. On Friday, Texans will legally be allowed to carry blades longer than 5.5 inches in most — but not all — places. This includes openly carrying the famous Jim Bowie knife, as well as daggers, dirks, throwing knives, stilettos, poniards, swords, machetes and spears. According to the proponents, the new measure will make doing work within certain professions (e.g., HEMA coaches) easier to conduct. Interestingly, similar laws are now on the books on Oklahoma and Montana. In the era of Live Action Role Playing (larping) and legalized marijuana, historic weapons enthusiasts are expressing their concerns. Hunter Follett, owner of Dallas-area sword shop Swords of Might, said the law might give a bad name to those who collect and train with medieval weaponry. So, if you are going to wield a sword, make sure to be trained by professionals…like my son, who is the San Diego Junior Cup Fencing Champion in Men’s Epee! Those of you who are interested in enjoying this new found freedom should check out HEMA Alliance for more information. Connor and Duncan McLeod will be happy as they won’t need to hide their katanas anymore. Although they never seemed to have a problem concealed-carrying their katanas. I was never sure how that worked. Duncan, is that a Claymore in your pants, or are you just happy to see me? I think this is still illegal in Texas, but you know, baby steps. In about five years my “No Solicitors” sign will have new and real bite to it. Get off my lawn! But first, dear serf, we require completed training course certificate, licensing fee, valid ID, current phone number and email. 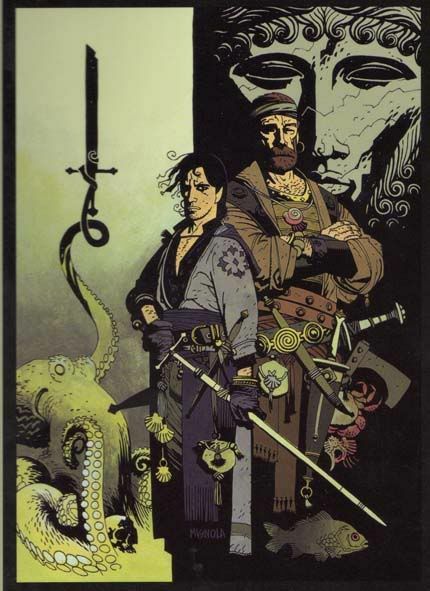 Fafhrd and the Gray Mouser consider their options. Somehow I don’t think I’m going to be slinging my Banshee over my shoulder next time I visit Texas. So, exactly why would this be a big deal in a state where one can legally openly carry a rifle in public? The State of Florida has allowed the open carry of long bladed weapons forever. The concealed carry of long knives, swords and other weapons is restricted by laws on concealed carry. Local ordinances generally determine what a person can openly carry in what jurisdiction. And, blood has yet to run in the streets. Will some yahoos cause trouble for the rest of the law abiding citizenry by in appropriate behavior with swords and long knives? Sure. But, if a few of them get shot, this will nip that problem in the bud. In Washington state there are no state laws concerning blade length, but there are local laws specifying what can and can’t be carried. For instance, in Seattle, it’s illegal to carry a double-edged blade of any length. We have been slowly eliminating the Reconstruction era remains of the fears of the first politicians after the military government turned the state over to the civilians. Fears of assassination which resulted in bans on concealed weapons and I don’t have a clue which Democrats enacted the blade weapons ban. LARPers don’t use live bladed weapons. Most of them don’t even own any; the ones that do own display pieces, not combat-ready weapons, and they don’t leave the house. HEMA and LARPing are as different as being a US Army reservist and playing too much Call of Duty. You can’t tell if it’s a sharp blade without checking, though, and trust me LOOKING like you have a weapon around some folks is dangerous. Miyamoto Musashi stopped fighting with live blades and continued to kill enemies and challengers with wooden “blades” (bokken). One of only two scars on my hands is from a butter knife. I tried to catch it when I knocked it off the counter…..
I’ve been cut a LOT, by knives and other stuff. I’m given to understand that bagel related injuries is a fairly common reason people end up in the emergency room. The two scars on my left index finger come from thumb-flicking to remove a scalpel blade and the blade didn’t budge. I started to do it properly with a hemostat after a visit to the ER for the second one, even though the incidence rate was well below 1/1000. And yes, the first 98% of self-defense is situational awareness. As my seal buddies put it, and they are still walking point, look forward and listen backward. I participated in LARP, SCA, as well as eastern and western sword training never have I understood why anyone would purchase anything other than a combat ready metal sword. My practice weapons are obviously that practice weapons (wood or poly) and my blades are obviously blades. When I needed a blade for LARP (rarely) I would simply peace bind it. Yeah but the best type of long blade, a sword cane is still banned, since it is technically concealed. Actually, a sword cane would not be a concealed weapon, in most jurisdictions, as an integral part of the weapon, the hilt, is readily visible, unless it was covered by something else which would conceal it. The blade is housed in what is technically a wooden scabbard or sheath. Now, many sword scabbards or sheaths are also made of wood. And, no one, with any intelligence, carries an unsheathed sword around. There are jurisdictions in which courts have ruled that as a sword cane is designed to look like a cane, it is therefor concealed. But, then strange legal reasoning exists throughout the land. That does beg the question of whether a properly stout cane is considered a weapon for carry purposes? Usually, a cane is considered a medical device, not a weapon; until it is used as one. However, some jurisdictions do specifically define a cane with features which make it more efficient when used as a weapon, such as sharpened handle points and metal ferrules, as a weapon, not a medical device. Generally, any solid wooden, or polymer, cane can be effectively used as a weapon with a little training. However, once used as an impact weapon, it can be classified as a deadly weapon, if intentionally used to target areas such as the head, neck and major joints. It is a question of legal intent. My baseball bat, carried with my mitt and a hardball, is viewed as sports equipment. Carried without the mitt, ball, cleats, etc., it can be viewed as an illegal club. A cane, used as a walking aid, is medical equipment; used to strike someone, it is a club. Yep, that is why in many places they specifically use the term “sword cane” when they are banned. I’m more frightened of idiotic and uninformed voters than of people carrying swords in public. Turns out we have a right to both. I’m more frightened of idiotic and uninformed voters than of people carrying swords in public. I’ve always been amused that many of those who claim the Second Amendment only protects a right to the weapons of the time of its ratification are some of the same people who support laws banning the carrying of edged weapons. It reveals that they really do not believe what they are saying about the Second Amendment at all; they believe that it protects essentially nothing, but they’re not intellectually honest enough (even with themselves) to admit it. If the 2nd only protects a blunderbuss, then the 1st only protects a quill. The smarter ones shut up after that counter-move. I’m amused at the idea that the founders weren’t well aware that rapid firing weapons weren’t in the offing. 20g with woodgrain stock, 12g with black composite stock, 26″ katana. Which goes best with a blue sport shirt, jeans and sneakers? Marijuana prohibition? It was a Democrat plot to put Blacks in jail. If moooochelle obama is allowed to walk around without a veil over her face, people should be allowed to walk around with anything. I don’t care how many knives or swords they bring, as long as I can bring my handgun. The best self defense weapon anyone can have is their brain. By increased awareness, forethought as to your route and the surrounding area, ability to improvise and not letting fear create panic. Plus a weapon that you’ve practiced with. No matter what it is. From a 3.5″ folding knife to a .45 pistol. Without what was mentioned in the first paragraph, what’s in the 2nd won’t do you much good. You know, every time one of these stories comes out, along with the “ain’t it awful!” hysterics, I think back to my tender youth when I could (and did) walk down the main street of my little town with a knife on my belt and/or a gun and nobody would look twice. Carrying a sword is a pain in the @$$. I say this because when I became an O-4 in the Nav I was obligated on certain ceremonial occasions. It hurts the furniture, and largely makes you unwelcome. That said, and if there is anything like sword etiquette in the twenty first century, at least know how to use it. The Navy didn’t declare Cutlasses obsolete until 1949. Premature, in my opinion as nothing says you are serious about Visit, Board, Search and Seizure (VBSS) as clawing aboard with your 1911 in one hand and your cutlass in another. Maybe with a knife in your teeth. Oh, yeah, BTW. In Texas this will get you shot dead. Knife in your teeth looks good on film but is a really good way to break teeth. On a double edged blade (or if you put a single-edge the wrong eay around) it’s a nasty way to get a really big smile…all the way back to your molars! I meant Glock. Or maybe Sig. Which is best for pistol whipping? Should I stick with the Colt? Thanks. It conforms to the informal survey that we and boys down at the CIA had concluded. When we talk about “Miracle Whip” it’s a racist dog whistle for beating someone of virtuous color to death. Not the condiment. In fact, the entire white supremacist brand “Miracle Whip” only exists to give us skin heads cover for our hatredy hatey white hate hate. Hate. I’m thinking of a famous Texas Ranger who used to tie down the grip safety of his 1911A1. And in the 1950s confronted safety instructors for the first time. And the instructor looked at the Ranger and his 1911 with the grip safety tied down and tucked into his belt and says that looks kind of dangerous. Why is everyone saying this is a new law? It’s been in effect for over a year!! As in so many areas of 2A Rights, Texas is once again very, very late to the party. There are a host of states which have never had such restrictions, and many had their laws repealed (thanks Kniferights . org! )prior to Texas _finally_ deciding to become more 2A friendly. Literally, Texas has been late or last to pretty much every rights expansion of the past 40 years. Texas isn’t as Texas as people think we are.